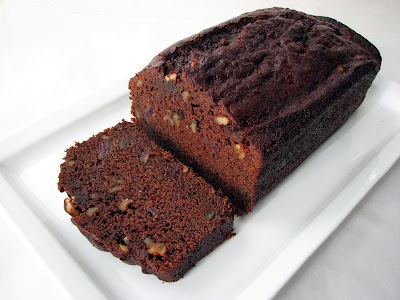 This is one of those loaf cakes that seems to fit effortlessly into the holiday season. It’s a bit of a complex flavor profile that comes from a range of very compatible ingredients harmonizing beautifully with one another in each successive bite. The idea for the cake is based on a palette of flavors composed by a brilliant pastry chef I worked for a few years back. 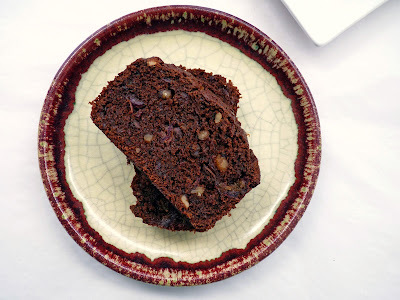 The cake has a deep cocoa richness and, along with the dates, toasted walnuts, coffee, spice and amontillado sherry, a very satisfying earthy quality. The back note of orange zest brightens the whole mixture and kind of ties it all together. I normally don’t combine so many flavors into one pastry because I think things get a little muddy when you have so much going on. But in this case, that memory of the taste of my chef’s date truffle dessert composition now transformed into a simple loaf cake still strikes a very warm chord for me. Grace your holiday table with this little feast or deliver it as a gift to good friends. ‘Tis the season for exactly this kind of rich and soul soothing offering. - I used 7 large plump medjool dates, which weighed 6 oz and measured a loose 1 cup when chopped. Cut them into pieces large enough to give a nice explosion of date goodness as you take a bite of the cake. - I used Lustau Dry Amontillado "Los Arcos" sherry, which is in between a fino (darker) and an oloroso (lighter). 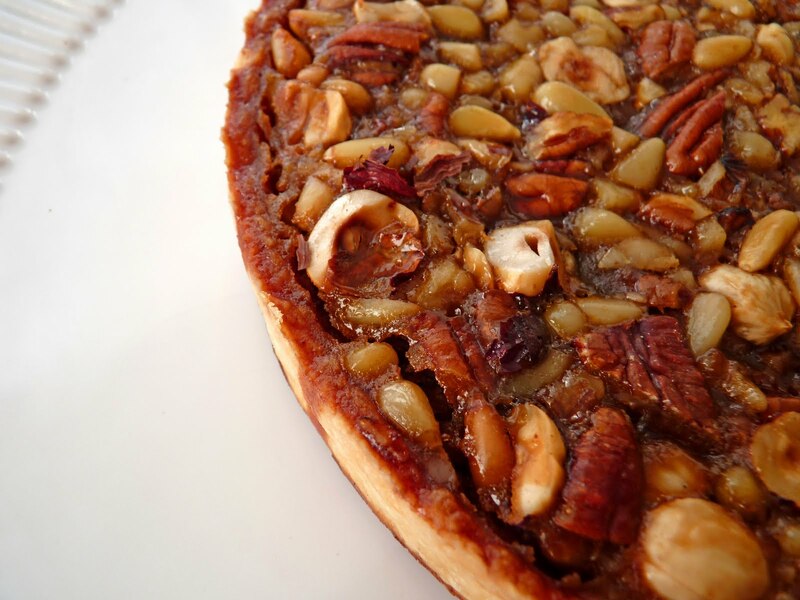 It is often served with olives or cheese, nuts and dried fruit. It has a nutty aftertaste with a hint of orange and molasses. You can also try rum or brandy. Or omit the liquor completely. - I think the cake is best the second and third day when all the flavors have a chance to relax and meld. After it has cooled completely, store in an airtight container. Preheat oven to 350 degrees. Toast the walnuts for just about 8 - 10 minutes. Pit the dates and remove the stems. Chop into coarse pieces and place in a medium bowl. Cover the dates with 1 cup of strong coffee. Add the zest of 1 orange and the baking soda. Melt butter and beat in the sugars. Add the egg and beat until the mixture is emulsified. Add the date mixture and combine thoroughly. Sift the flour, cocoa powder, salt, cinnamon and nutmeg. Combine milk, liquor (if using) and vanilla. Alternate adding half the flour and all the milk mixture, beginning and ending with the flour. Once all the ingredients have been added, mix just a minute or so until everything is fully combined. Fold in the toasted walnuts. Pour the mixture into the prepared loaf pan. Bake the cake for about 55 minutes or until a toothpick inserted in the center comes out with a few moist crumbs attached. Cool the cake on a wire rack for about 30 minutes. Remove it from the pan, carefully peel off the parchment paper and cool the cake completely. 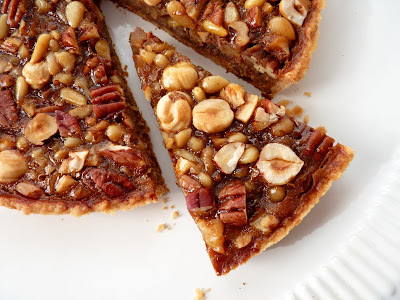 This is the season for those who love the taste and texture of toasted nuts. 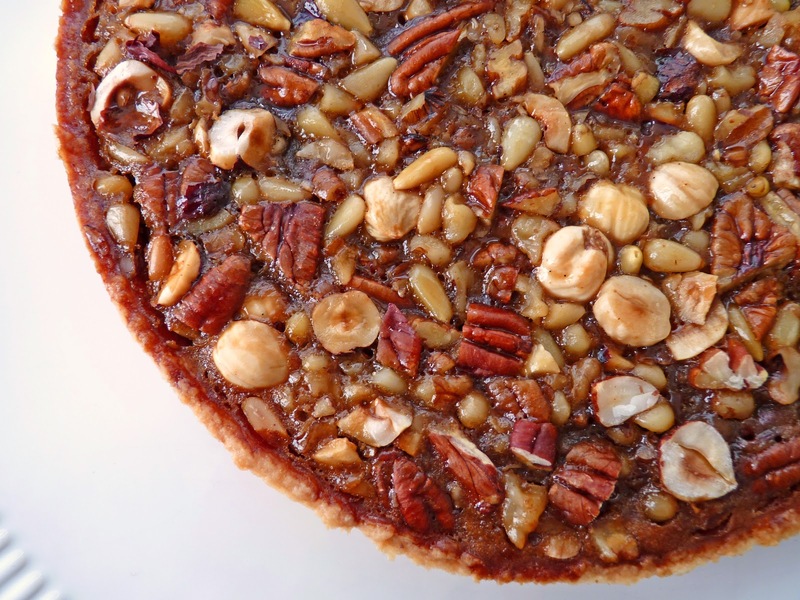 Pecan pie is a perennial favorite this time of year and this tart follows loosely in that tradition. I begin with the Tarte aux Trois Noix (Triple Nut Tart) from the The American Boulangerie cookbook, which I like because of its lower sugar content and the fact that it doesn’t rely on a heavy dose of corn syrup, substituting part honey instead. Many pecan pie recipes have twice the sugar/corn syrup sweetness, so this is more of an emphasis on a great mix of toasted nuts. And since I love the flavor of coffee in this kind of dessert, I changed up the basic recipe by adding some instant espresso powder. I’ve presented the original recipe below along with a couple of my revisions so you can make your own choices. The aroma of this baked tart is really lovely. It's not too heavy or extremely rich and it's grand when accompanied by a small dollop of whipped cream or a little scoop of vanilla or coffee ice cream. For nut lovers only. - Browning the small amount of butter takes only about a couple of minutes. Watch it closely because it will burn and you’ll have to start over. I always lift the pan off the heat periodically and swirl the butter to control the browning process. You want only a light brown, not too dark or it will taste bitter and overwhelm the vanilla. - Use whatever nut combination you wish. You could also add a pinch of cinnamon to the filling. - I added a half of a vanilla bean, which gets steeped in the butter as it's browned. I also upped the rum to 1 T + 2 t for a bit more of an edge and added 1 T espresso powder. I thought it needed more salt to pique the flavors so I used a generous 1/4 t salt. - The original recipe uses a pâte sucrée tart shell, which has more butter and sugar and an egg, but I decided to use a plain pastry shell. Use your own favorite recipe if you wish. For the tart shell, place the flour, sugar and salt in the bowl of a food processor and process until thoroughly combined. Cut the cold butter into small pieces and add to the flour mixture. Pulse until the mixture looks like very coarse meal with butter in small pieces about 1/8” - 1/4”. Add the cold water and pulse until the dough starts to clump around the center of the bowl. Remove the dough and wrap in a piece of plastic. Chill for about an hour or so. Remove the dough from the refrigerator and place on a lightly floured piece of parchment or work surface. Let it sit for about 3 – 4 minutes to take the chill off. Lightly dust the surface of the dough with flour and roll out to a round shape large enough to line a 9” tart pan, keeping the work surface and dough lightly floured as needed. Lift the dough and gently shape it to fit closely into all the contours of the pan. Prick the bottom of the tart dough several times with the tines of a fork. Bake for about 25 minutes or until light golden brown. Place the butter in a small saucepan. Split the vanilla bean lengthwise with a sharp thin knife and scrape the seeds into the butter and toss in the bean. Melt the butter over medium low heat. Let the butter foam up, watching it closely until it just begins to brown slightly. Lift the pan up off the heat and swirl it as it continues to brown. Return to heat for just a few seconds if it’s not quite a light nutty color, swirling constantly. Take off the heat, pour into a mixing bowl and cool for a couple of minutes. Remove the vanilla bean casing and whisk in the sugar, honey, dark corn syrup and eggs until the mixture is thoroughly blended. Combine the rum and espresso powder and add to the filling. Place the baked tart shell pan on a baking sheet. 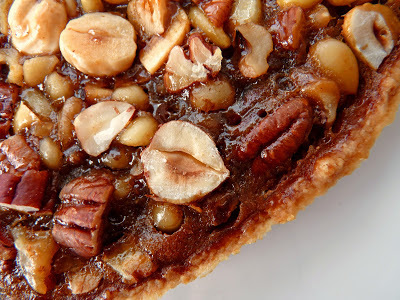 Sprinkle the nuts in an even layer in the bottom of the tart shell. Carefully pour the liquid evenly over the nuts. Bake for about 20 minutes or until the filling is golden brown. The filling will look puffy but will settle down quickly as it cools. Place on a wire rack and cool completely. We are now squarely planted in a chilly season that calls for the warm embrace of spice and chocolate. As evening breaks earlier and the familiar sound of rain arrives right on cue, ginger and chocolate seem to join perfectly together at our table. This is a recipe that balances the boldness and intrigue of these two earthy ingredients. 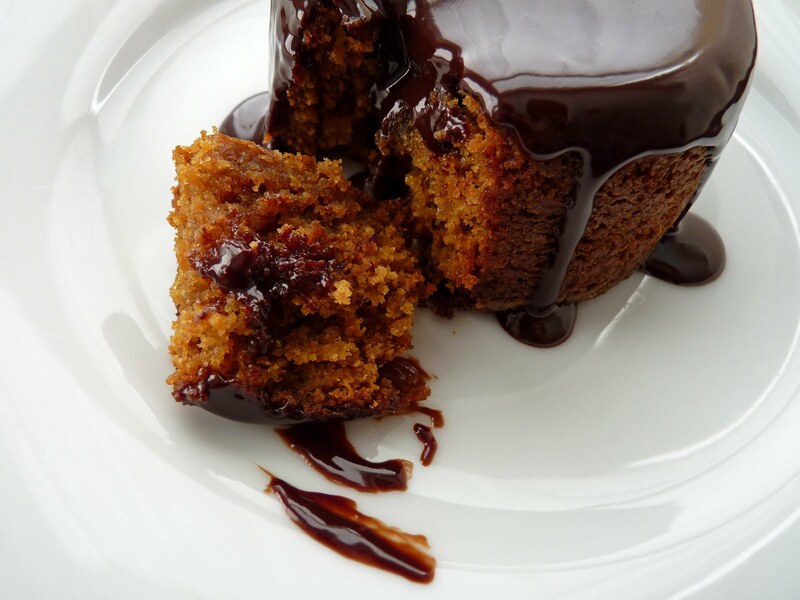 The cakes are warmed by a full jolt of ginger and the richness of molasses and deepened to a sort of butterscotchy goodness with pure butter and a splash of rum. Once the cakes are plated they are handsomely draped in a sheen of dark chocolate to make resistance nearly futile. Heady aromas, chewy and silky textures and strong but soothing flavors co-mingle all in one bite. This is a rich and satisfying homage to fall. Share over a cup of good strong coffee or a nip of your favorite spirit. - Coarsely chop the crystallized ginger into small pieces using a sharp chef’s knife. It gets sticky but keep going. Add the chopped pieces to the flour mixture and toss to coat and separate. - When adding the egg and the molasses to the creamed butter and sugar mixture, it will start to break but it will come together once the rest of the ingredients are added. - I baked these in 6 oz (3.75" diameter) tapered ramekins for 23 minutes. You can also use a standard muffin pan, which will yield about 6 smaller cakes, so those will bake much quicker. Check them after about 13 - 15 minutes. 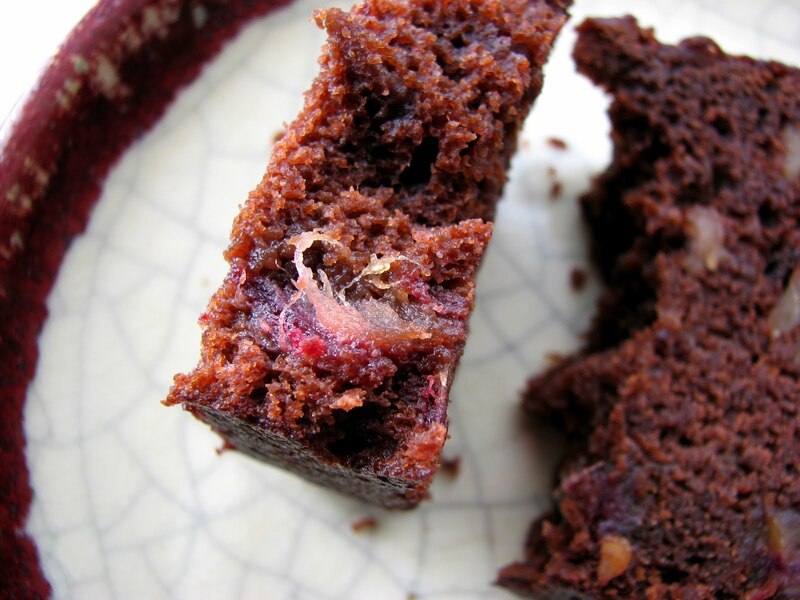 These are very moist cakes with a dense crumb so be careful not to overbake. A toothpick test for doneness should have a few moist crumbs. 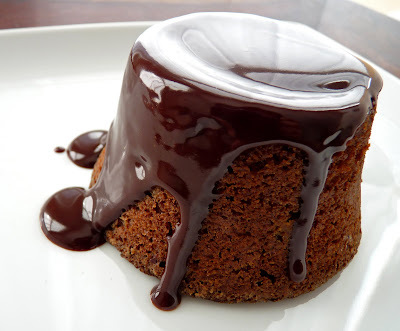 - For the chocolate glaze, chopping the chocolate into fairly small bits helps it to melt more evenly and efficiently. When the hot cream is added, let it sit for about 2 – 3 minutes so the chocolate can absorb the heat. Then stir gently and slowly, starting in the middle and working outward in concentric circles, to prevent it from cooling down too fast and creating air bubbles. The glaze can be reheated over a low simmering bain marie. - You can add a couple of teaspoons of corn syrup to the glaze to keep it shiny and improve viscosity. 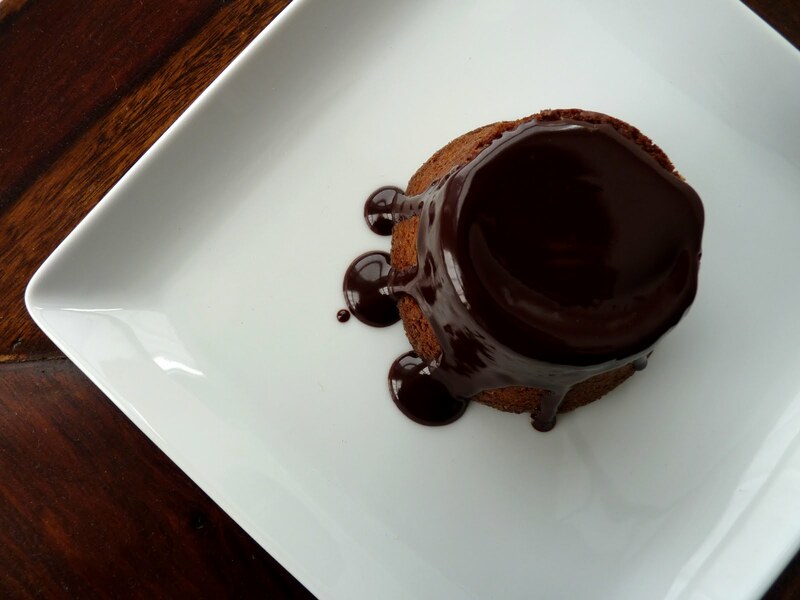 - An alternative way to enjoy these cakes is to forego the chocolate glaze and serve them with poached pear or sautéed apples and cream or simply with some whipped cream flavored with rum, brandy, Kahlua or orange liqueur or a little bit of marmalade. Or vanilla ice cream, of course. - If you love ginger, try a delicious Ginger Ice Cream. Preheat the oven at 350 degrees. Grease four 6 oz custard cups or six of the cups in a standard muffin pan. Sift together the flour, ground ginger, baking powder and salt. Finely chop the crystallized ginger. Add to the flour mixture and toss with your fingers to coat and separate each piece. Combine the milk and the rum. Cream the butter and sugar until light and fluffy. Add the eggs and mix thoroughly. Blend in the molasses. The mixture will look like it’s breaking. Add half the flour mixture and mix just a bit. Add the milk and rum and continue mixing. Add the remaining flour and mix just a few seconds. Finish mixing by hand until all the flour is incorporated. Pour into prepared custard cups and place on a baking sheet. Bake for about 23 minutes or until a tester comes out with a few moist crumbs. Place on a cooling rack and cool for 10 minutes. 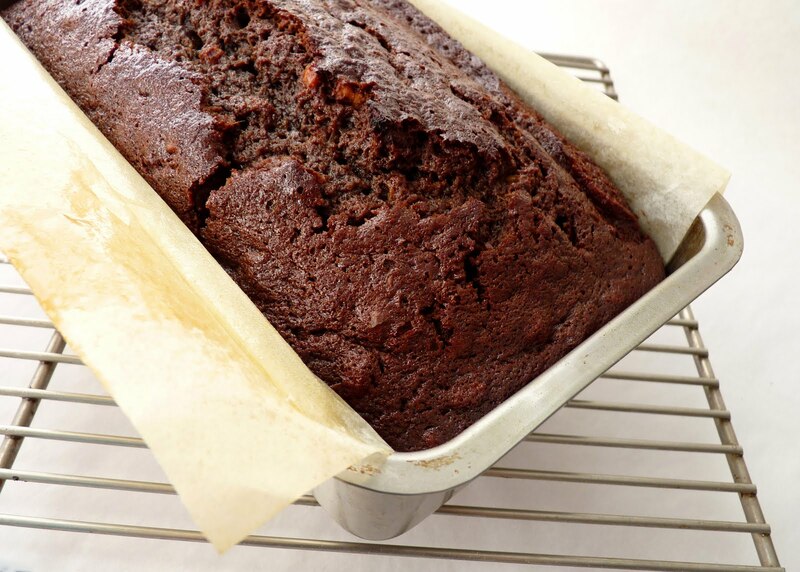 Run a small spatula or thin bladed knife around the edges to loosen the cakes and invert. 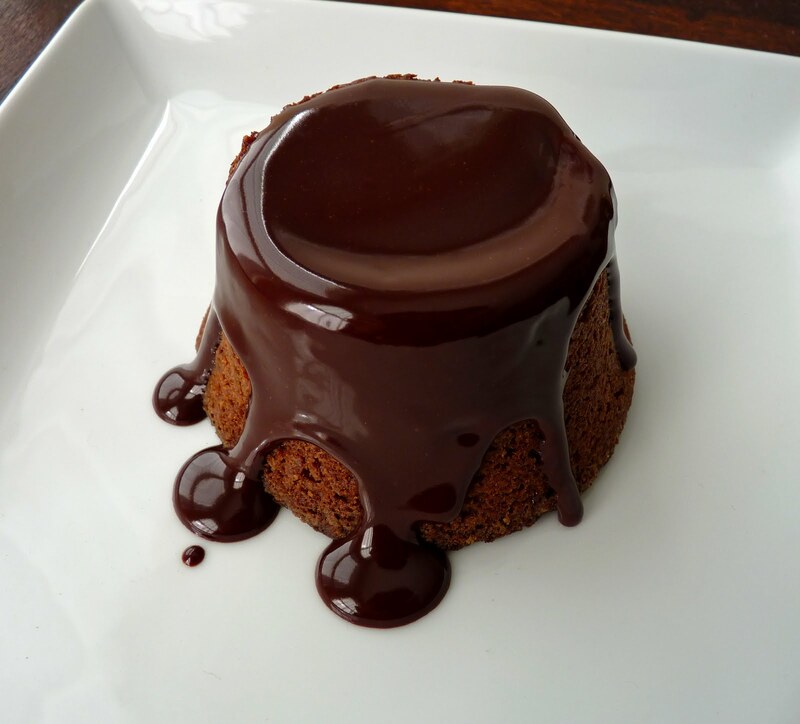 For the chocolate glaze, finely chop the chocolate and place in a bowl. Heat the cream (and corn syrup, if using) on low heat until it reaches a good simmer. Remove from heat, add vanilla and pour over the chopped chocolate. Let it sit for about 2 - 3 minutes. Stir slowly until fully combined. Plate the cakes and spoon some chocolate glaze over the top of each. I’m one of those people who thinks they don’t like coconut until they taste something really good that has coconut as a central ingredient. I’m not sure why this is so, except to say that I had some very funky coconut stuff as a kid, where sugar was the star ingredient. Funny how those childhood attitudes about food can take hold. So I still sometimes need to be coaxed into tasting a coconut product. But then when I do, I'm suddenly back to remembering that coconut isn't always sandbagged by an avalanche of sugar and it's got its own particular flavor and texture to behold. Lesson learned. Again. This is a pretty simple coconut shortbread cookie. I’ve added a touch of almond to enhance the nutty flavor of coconut. 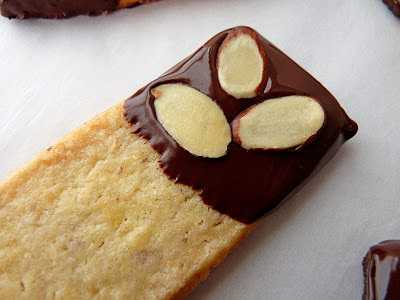 The baked cookie then has a brief encounter with coconut’s soul mate, bittersweet chocolate. Very easy and straightforward, free of doubt. - Unsweetened coconut usually has the best flavor, but I’m using a sweetened version here because it’s usually what people have easy access to in most places. 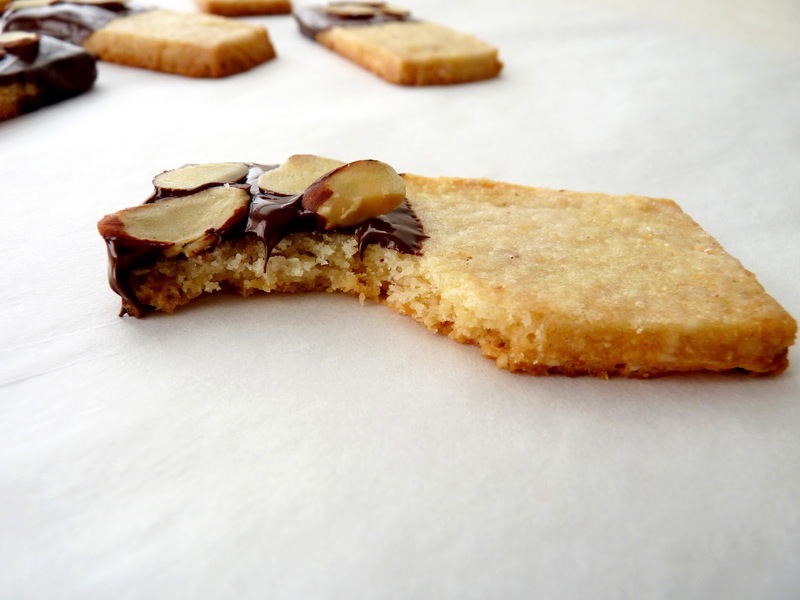 - Before coating the cookies with chocolate, I use a pastry brush to eliminate surface crumbs. Then I coat the top and sides and scrape the bottom of the cookie against the rim of the bowl to remove excess chocolate. That will take care of drips and the “feet” that form as a result. - I rolled each dough packet out to a rectangle a little bigger than 8" x 5" and then cut out 16 2 1/2" x 1" rectangles, measuring the length and then using an old fashioned wooden ruler as a template for the width. But cut cookies into any shape you wish; just be sure they are all the same size for even baking. - When melting chocolate, always keep the bain marie or water bath on a very low simmer to keep the chocolate from scorching. Stir it gently and remove it from the heat when it is melted. - Store cookies in an airtight container. They will soften over time. - If you're a fan of coconut, you might also enjoy Coco au Miel. 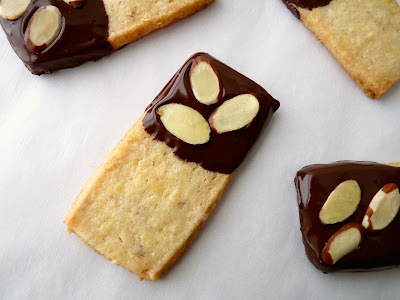 Toast sliced almonds @ 350 for about 6 – 8 minutes. Watch them closely as they will burn easily. 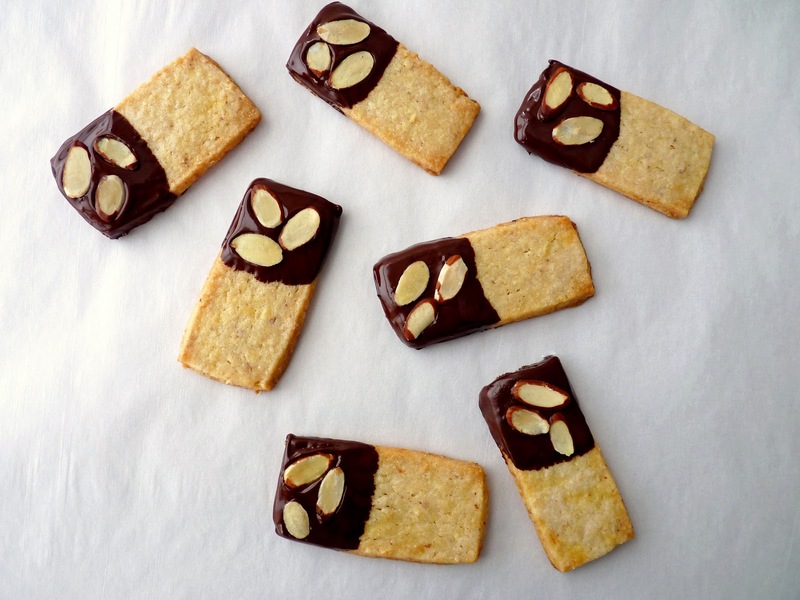 Turn off the oven and let the almonds cool. Place flour, 1/4 C almonds, coconut, sugar and salt in the bowl of a food processor and pulse until the nuts and the coconut have been turned into large crumbs. Cut the butter into small pieces and add to the mixture. Pulse until you see the butter breaking down into pieces about the size of a pea. Add the egg yolks and vanilla and pulse again until the mixture begins to clump around the center of the bowl. Gather the dough together and divide in half. Flatten each half into a medium sized rectangle and wrap each in plastic. Chill thoroughly. It will keep chilled for 2 days. Remove one packet of cookie dough and let it warm up slightly at room temperature for a couple of minutes. Roll the cookie dough out on lightly floured work surface (I use parchment) to a scant 1/4" thickness, keeping it in a rectangle shape. Cut dough into cookies that are 2 1/2” x 1” rectangles. Transfer cookies to the prepared baking sheet, spacing them 1" apart. Return to the refrigerator while you roll out the next piece of dough. Repeat the process and chill the cookies. Bake cookies until they just begin to take on some color, about 13 – 15 minutes. Cool completely. Melt the chocolate in a bowl over a slow simmering bain marie, making sure that the water is not touching the bottom of the bowl. Using a rubber spatula, stir the chocolate until it is smooth and completely melted. Remove from heat. Dip a portion of each cookie in the chocolate and scrape the bottom across the rim of the bowl to remove excess. When you’ve done a few, stop for a moment and garnish each with some sliced almonds. Continue until all the cookies are finished. Work as quickly as possible while the chocolate is still quite fluid. You may need to carefully re-warm it to proceed to the final batch.